People For the American Way is having a contest to come up with the best slogan for a bumper sticker for a potential Sarah Palin/Glenn Beck run for president in 2012. There are lots of great ones, but these four are my favorites. See the rest and vote here. Oh brother.... Just like the rest of the time that the liberal main stream media cannot get the story right... 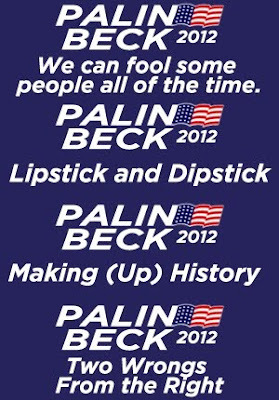 There is not going to be a Palin/Beck ticket in 2012. I know there's no Palin/Beck ticket, but they are the leaders of the Republican party (whether they or the party acknowledges it or not). One can dream, can't one? There is no better path for an Obama re-election than for the GOP to nominate a know-nothing extremist like Palin. By the way,the "contest" is not from the media, it's from People For the American Way, which is a liberal advocacy group. Just expressin' some freedom of speech! Hmmm... Palin I guess could be called a "leader" of the GOP even though she fought for and was a Democrat darling for getting corrupt Republicans removed from office and some in jail when she was governor. As for Beck, he criticizes the GOP nearly as much as the Huffington Post. Palin was never a "Democrat darling." No one ever heard of her until John McCain plucked her out of obscurity and foisted her idiocy on America. Palin does things for her own benefit only. She got any Republicans out of her way to benefit her, not Democrats. Beck may criticize the GOP once in a while, but he refers to progressives as a cancer on America, and frequently uses violent rhetoric to discuss dealing with liberals. Let's not confuse the issue. His followers are not Democrats, they are all, 100% Republicans (including their sub-party, the teabaggers). He, like Limbaugh and Palin, are the leaders of the GOP. Is the tan man supposed to be the leader? I doubt he could get out of the tanning bed or the bar long enough to get anything done. Oh wait, getting nothing done is the agenda, so...never mind on Boehner. Dave, I think getting nothing done would be far far preferable to getting done what has been "accomplished" in this last congress.